I've occasionally shared my life with goats. Think dogs with hooves. As livestock, they have lived with humans all over the world in some of the poorest pastures imaginable, giving meat, hides and milk, and fabulous cheese. As pets, they are fine companion animals for humans, horses or other livestock, and can be taught to drive or all kinds of fun: dancing, agility tricks etc. I volunteered to foster Butterscotch and Sprinkles (aka, Butterscotch Ice Cream, aka Mocha Latte) and Sprinkles (aka Ms Sassypants aka Dark Chocolate Milk). They are LaManchas, which normally have very tiny ears ("elf ears" or "gopher ears"). They come in every goat color there is, but these two look like breakfast drinks. Butterscotch is slightly lighter and has more impressive horns. They are very friendly and love treats, and should be easy to halter train and if there is time, perhaps drive. Here's a look at their first day with lots of pasture and a couple of Big Hairy Monsters. The horses are Svaha (mustang/Arabian) and Goliath (mustang). They are used to goats and were interested to have new friends. The pasture here is a dry lot, Svaha cannot be on lush grass. (everyone gets plenty of hay and Golli has his own grass pasture) It is also winter, so everything is the same color as the goats. The toys in the paddock are originally for the Siberian huskies to climb on and leap over, as well as to school horses over (old horses, so it's at a walk). The goats are amused. Goats love to climb. Here I have woven wire fence to the ground (Siberian proof and goat proof, also proof against random wandering dogs and coyotes)(though Golli would certainly stomp any predators that got in). Goats, like Siberians, are escape artists, so a secure fence is important. I have a run-in shed horses and goats can go in when they want to be out of the weather. Both are quite hardy and often like to stand outside. It's healthier than being locked up in a barn. The goats have one side of the run-in with a horse-deflector: a rope (and later a 2 x 4) that lets the goats under but not horses. One Siberian can be told OFF! and she will ignore the goats on the other side of the fence. The other is larger and more enthusiastic and is kept on a long line for now so the OFF! can be enforced. If you have goats and dogs you'll need to introduce them carefully, and teach the dog to stay back. 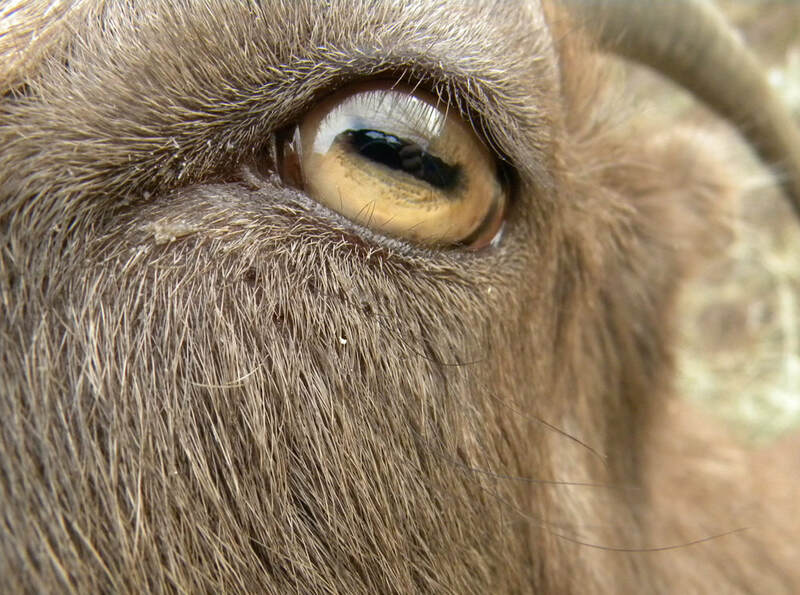 Goats will defend themselves by lowering their heads and ramming. Goats make wonderful intelligent pets or companions for other animals. Goats with horns are no more hazardous than horses with hooves or dogs with teeth! It's all about training. Goats are browsers, horses are grazers. I usually throw hay on the ground for the horses, but goats object to food that smells funny or doesn't meet their standards (even though they taste everything from the wooden platforms here, to clothing, to rope to the pool noodle lining the edge of the gate). I rigged a hay rack in a section of the paddock the horses can't reach (roped off by electric rope the goats duck under). Sheep, by the way, are grazers, and can't eat goat feed: the copper in it is toxic to sheep. Sheep and goats are related, but not close enough to produce hybrids (except very very rarely). An old kiddie gate cable tied at the bottom creates a hinged hay holder (bungeed at the top). The hay is held against the fence so the goats can stick their tiny muzzles through the fence rectangles to eat. I spread a few of the rectangles a bit to make them bigger. The goats also like to lie down here. Horses don't often lie down, they usually rest standing. Goats are even toed ungulates with stomachs like cows: multiple chambers, so they chew a cud and lie down while doing it. The run-in shed is roped at the front to exclude horses. The goats make nests in the back on the straw. Goats (and the original type of sheep) have thick hair coats with an undercoat of wool. Both goats and the primitive type sheep (hair sheep breeds) shed the wool in spring. You can comb it out with a dog rake. The goats are bonded (possibly sisters?) and like to climb on the stuff in the paddock (set up originally for dogs and horses). They also do what goats do, bock each other with their horns, often rearing first. They also shove each other. It's all play. They are quite gentle with humans. They use their horns to scratch themselves, and to defend themselves against predators (think coyotes or stray dogs). They also look magnificent. Halter training is pretty simple, tug, click, reward. A tongue click is easier than carrying a clicker, and I don't accidentally feed it to the goat. When the goat steps forward, I stop tugging. I can also use a training wand to tickle or tap the goat forward...or a come along, a rope around the hindquarters. Or get a friend to walk ahead so the goat has someone to follow at first. Reins (line on each side) begin to teach the goats to turn "gee" or "haw" with voice commands. Gee and haw are used for most driving animals including sled dogs. Sprinkles stood up on the chair and I turned it into a "trick"... click, reward. Goats have an instinct to climb. think mountain sheep, it's how they evade predators. A family signed up to adopt the goats. Here they are meeting the goats. The goats work as well in collars as halters, so they're only in collars for this. On a trail, or driving, I'd put a goat in a halter, as with a horse, you have more control, they're very strong. Of course even horses can be trained to work at liberty or bridleless. Sprinkles occasionally used her horns to bump people to show her dominance ("bow before the queen!"). This is something to work on in training. Both are quite happy to follow people around... and to dig into your pockets for treats. As with any animal, especially ones bigger than you, you maintain awareness of where your face/feet/other body parts are in relation to hooves/butts/horns/teeth. Like, don't place your face above a grazing horse/goat/cow/etc... a raised head will fling you a few yards, break something, or poke holes in you. The girls were quite thrilled with their new goats. A third animal was added to the adoption: apparently the SPCA had a chicken (in a kitty carrier). The hen's boyfriend had been picked up by an eagle (though I wonder if it was actually a redtail hawk) and eaten. The hen escaped but no longer lays eggs. She is quite lovely and black with iridescent feathers. I made some emergency collars out of binder twine (aka baler twine) for the goats to travel in.